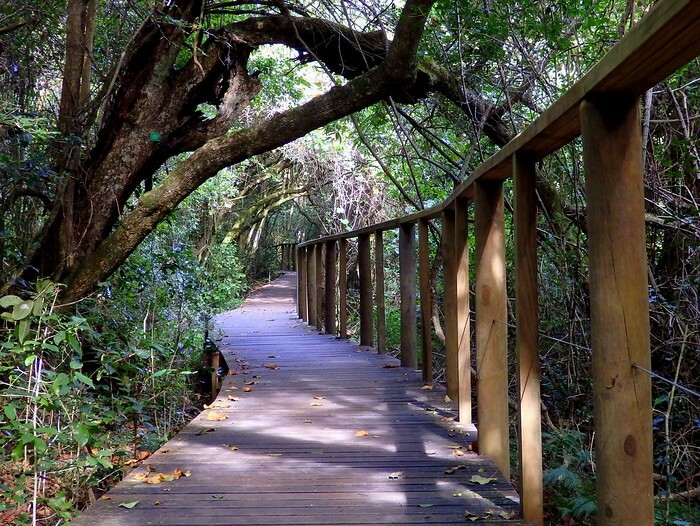 On the must-do when visiting South Africa, tourists find it a must to do the Garden Route. I have listened to many and different stories. A few people were saying traveling the Route is an amazing trip, others were saying its all about tourism and has nothing to do with the real South Africa. I was advised to go further east to actually experience this beautiful country. As I had two weeks to spend I decided to go on a trip from Cape Town to Durban to find out for myself what is true. I decided to go up the coast by Baz Bus. Quick Tip: For those looking for a convenient way to travel South Africa in my opinion Baz Bus is the best choice- a bus mainly used by Backpackers. The bus stops at a bunch of hostels and enables you to hop on and hop off anytime and anywhere. Another benefit is that you meet people from all over the world while traveling. The Baz Bus drivers are super friendly, entertaining and welcoming. Also they understand themselves as a sort of tour guide and provide information about history, culture and the landscape of South Africa. First stop for most tourists traveling the Garden Route is Mossel Bay. It´s a cute city about four hours east from Cape Town. A definite tourist attraction is the train hotel “Santos Express”. It is a train right on Santos Beach that has been turned into a hotel. The beach is perfect for a swim as there is not such a strong current. For those looking for a smaller village and a bit more peace and relaxation I would recommend to go further east and to stop at Wilderness or Sedgefield. These villages offer stunningly beautiful beaches and an outstanding landscape. Swimming is a bit dangerous though due to a strong current and the tides. I stayed over in Sedgefield for one night. My hostel Afrovibe is situated on Myoli Beach— 14 km of unspoilt beach. Either you go for a long beach walk, a run, take a surf lesson or book one of the day trips they offer. Also this place is perfect to just relax. Meeting new people is easy in the restaurant “The Pili Pili” which is next to the hostel and provides delicious food and drinks. I had one of the best Pizzas in South Africa there! 214 meter of pure adrenaline. The highlight – 15 minutes away from my second Baz Bus stop “The Crags”- is definitely the Bloukrans Bridge. With 214 meters it is the highest bungee jumping bridge in the world. The bungee jumping team is extremely professional and they know exactly what they are doing. Surrounded by the vibes of african house music I was number one to jump from our group of 15 people. It was an incredible feeling. I spent 2 nights at the hostel “Wildlife Spirit”. The name already says it all, I think. Wildlife Spirit is situated in the heart of the Garden Route and the Tsitsikamma National Park. It is surrounded by indigenous forests, pristine beaches, waterfalls and mountains. A must stop for nature lovers. Also the hostel is the perfect spot to start your hiking experience from. My recommendation: don’t miss The Big Hike at Natures Valley – insanely beautiful. The surfers paradise – Jeffrey’s Bay. “Jay Bay” was the place where I wanted to catch my first wave. Learning how to ride a surfboard like a professional was my ultimate plan. Eventually I ended up not taking my lessons in Jay-Bay. Why you ask? Because of my hostel “Island Vibe”- their amazing staff and the new friends that I made in Baz Bus had other plans: Party, Party, Party. The hostel has an amazing vibe, beer pong is on every single day and that means your hungover most of the time. If I hadn’t have planned my next pick up with Baz Bus, I would have been happily ‘stuck’ there for days. That is what happens to most tourists in Jay Bay. Also, whilst you are in Jay Bay don’t miss out on the bargains in one of the Billabong outlet stores- you won’t be sorry. Located about an hour away from Jeffrey’s Bay, you’ll find Port Elizabeth. As one of South Africa’se biggest cities, PE is also the pretty much end of the Garden Route. If you travel by Baz Bus you have to stop here for a night. We arrived in the friendly city at 10pm and I had to leave with the next bus at 6am in the morning. That´s why I did not really have time to explore PE. My hostel Lungile Backpackers is located in a safe area about 5 minutes away from the beachfront with lots of bars, restaurants, clubs and the main beach. PE is also the gateway to the game reserves of the Eastern Cape. The most famous one is Addo Elephant Park but there are many other remarkable reserves in this region. Don´t forget to stop at one of them. They offer some incredible wildlife experience. What else to do in PE? A must see is the Red Location Museum. It is an Apartheid museum in the New Brighton township of PE. For those looking for good parties I can recommend the beachfront, Central and Walmer. You want to go for a surflesson? Humewood is a famous surfing spot. Finally we were leaving the Western Cape and we were on our way to another side of South Africa. Famous for the Eastern Cape are the colourful round huts. We were passing small villages with about 20 huts but also bigger towns. People, cows and chickens were walking on the streets. Our driver stopped in the middle of nowhere dropping off 20 loaves of bread for a family he is helping with food. About 30 adults, children and animals were waiting for us to arrive. 3 and a half hours further east from PE we were about to arrive in the ‘real’ South Africa- something I had been waiting for that so long. Chintsa was my first stop in the Eastern Cape and about 40 km away from East London. Welcoming me from the balcony of my Hostel “Buccaners” was a breathtaking view of the endless beach and the lagoon. At Buccaners I met Asanda. She worked for this hostel and is Xhosa. From a last minute decision she joined me on my way to Durban. Later on she moved to Cape Town and is still one of my best friends. You would like to read more about Asanda? Then click here and “Meet Asanda”! My second last stop 250 km away from Durban was Coffee Bay. On our way we were surrounded by incredibly beautiful nature. We were passing a village with burning tyres, people demonstrating on the streets and throwing stones. This is South Africa too, I must be honest. Later on our driver explained that the people were protesting against the governing parties decisions. Most people earn´t happy with the decisions the governing party made. Whoever thought Chintsa as being in the middle of nowhere was wrong. I think that title can be reserved for Coffee Bay. We had 5 more minutes to go to Coffee Bay – the streets were not even tarred anymore. Oh, you thought Coffee Bay is famous for its coffee? Then you are wrong. Coffee Bay got it´s name from a cargo ship that ran ashore and scattered beans which grew to coffee trees. Coffee Bay it self is a small village surrounded by the incredible landscape of the Eastern Cape. Here I did one of my best hiking experiences the “Hole in the Wall” hike. The hike it self is four hours and it offers you the most stunning landscape of the Eastern Cape. Definitely a must do activity. Another activity Coffee Bay is famous for is surfing. Also in my hostel “The Coffee Shack” they offer the cheapest surf lessons I have found so far. A two hour lesson including wet suit and board for just R50. Another fact I really loved about the hostel is that they give free mussels and oysters to their guests every evening. They also offer cultural experiences like sleep over in huts or traditional dinners with a Xhosa family. My recommendation: try Xhosa bread – it is delicious. From Coffee Bay to Durban it took us another 8 hours by Baz Bus to get there. My hostel “Happy Hippo” is just 5 minutes away from the endless uShaka Beach. If someone would have taken me to that beach without telling me where we are I would have assumed I am in Miami. In fact the beach promenade with its bars, restaurants, surfshops and skyscrapers in the back reminds of the metropole in Florida. Durban is more indian influenced. Durban! Indian? Exactly cause Durban has the largest Indian population outside of India in South Africa. When you are in Durban you have to try Bunny Chow. This is half a loaf of bread which is either filled with chicken, beef, beans or fish curry. It is delicious. Also interesting to see is the aquarium uShaka Marine World, the Wharf of Durban and the Eastern Spice Market. The party street you can compare with Long Street in Cape Town is Florida Street. If looking for a hostel next door is best advised to stay in Tekweni Backpackers Hostel. For me the most convenient way to get around in Durban is uber. A more local way of getting around is the mini bus taxi. Asanda and I decided to use this common way of transportation to go to a shopping center. Basically no big deal in Cape Town as there are just a few routes you can easily figure out and the locals are used to tourists taking the busses as well. It is another story in Johannesburg and Durban. Both cities are huge and if you don´t know where to go then you can easily end up jumping into one bus going in the wrong direction. This is why Asanda ended up asking one of the drivers which bus to take but they ignored us. It took us 3 attempts to actually get a response. I was 100 % sure traveling with a South African women in South Africa would actually help but in that case I was wrong. Durban is Zulu area, Asanda is Xhosa and both cultural groups don´t get along with each other that well. Eventually everything went well and we had 3 cool days in Durban. My opinion: Yes, the Garden Route is beautiful but it is really touristy. For those who are keen to get to know the real South Africa my advice is to go further or all the way from Cape Town to Johannesburg. Also the trip I did to Durban is worth it. 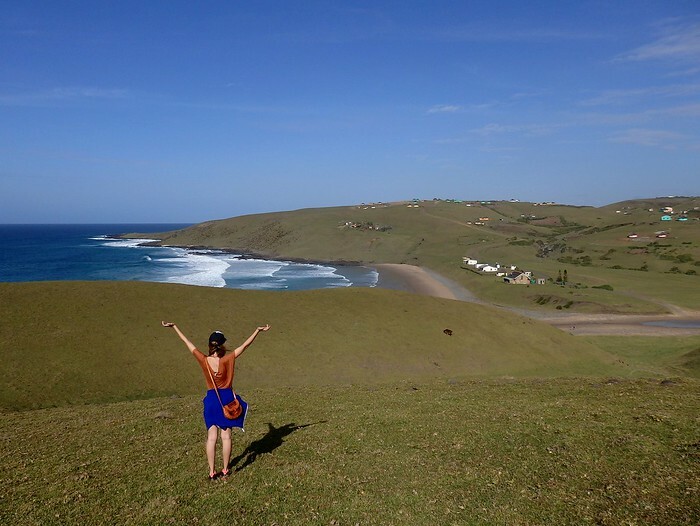 Follow her blog for more posts on South Africa! While travelling with Baz Bus you get to know a lot of people and with most of them, you exchange advice on which stops you can happily skip and which stops are an absolute must do on your road trip. Most people recommend different things, since every person has its own priorities, personal taste, and travel goals. But there is one certain thing on which every single person I have met during this trip without exception agreed: You MUST go to Coffee Bay! So I went, being super curious about what fascinated all these people about this place. Arriving there, I get it pretty fast. The shuttle from Mthatha takes a while to get to Coffee Bay, but regardless of the distance of the ride, you get to enjoy every single minute in the minibus. Driving along the curvy road, passing thousands of light green grassy hills, covered with traditional African rondawels, I say to myself: This is how I imagined the “real” Africa to be. It reminds me a lot of Lesotho, only brighter and somehow, fresher. Coffee Bay is located in the heart of Transkei, the area in South Africa that is still characterised by the traditional Xhosa way of life. Crossing this area, watching the unindustrialized beauty of this country, I realised this is exactly what I wanted to see! 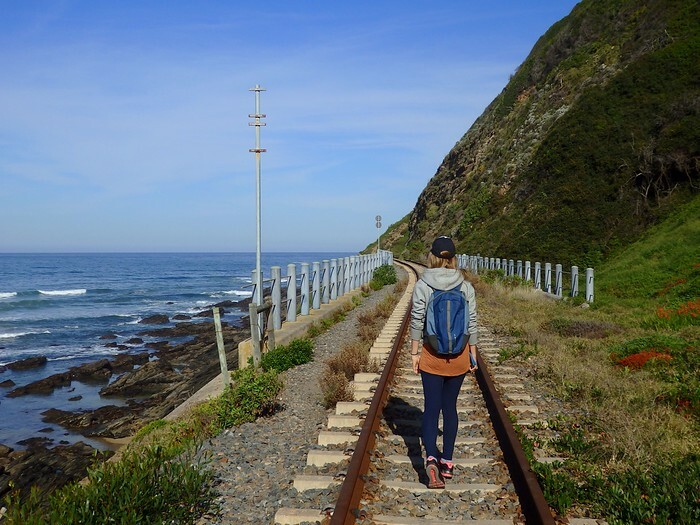 One of the must do’s activities around this area is the hike to the Hole in the Wall, an extraordinary rock formation located at a tropical beach in the heart of the Wild Coast. As we stayed at the Coffee Shack Backpackers, which provides a cheap shuttle service to that beach, we decided to take a lift there and then hike back to the hostel. The walk is about 9 kilometers long, takes about three hours and is considered as quite manageable. So let’s go! If you take the shuttle, make sure you sit down at the back of the van. It is so much easier to enjoy the scenic beauty around you- just like that – and the drive is so much more fun! The Drop off point is on top of a hill that faces the beach. From there you can already see the Hole in the Wall and even from the distance it already looks spectacular. But as we get closer, slowly, making our way down the grassy hill, walking along the beach inlet at the bay, the appearance of this massive rock formation becomes absolutely stunning. It is HUGE and the way the waves cosily break on it making their way towards the beach through the hole create such a nice and peaceful atmosphere. When the temperatures allow you to, go and enjoy a closer view while taking a refreshing swim in the crystal clear water. Though it might appear tempting, you should definitely avoid taking a swim through the hole when the waves are too strong – never underestimate the strength of the ocean! You don’t want to find yourself being pushed against the rock by a heavy wave. So we rather stay on the safer side – and this is clearly enough to spend an amazing time at this stunningly beautiful place. After relaxing at the Hole in the Wall, we decided it was time to start the hike. The path takes us along the beach, where cows are snugly cuddling at the shore, enjoying their tropical surroundings and the sunny weather, just as much as we do. We move further to another extraordinary mountain formation – a massive slot, framed by two extremely high rocks. And as we imagine, how amazing the view from up there must be, we cannot resist, but climb up there. It is super steep and super hard, but absolutely worth it! It gives you an amazing view of the Hole in the Wall from a totally different angle. And from down at the bottom, you appear ridiculously small which is super funny on pictures. It’s definitely worth climbing up there quickly before continuing the hike, it only takes about five minutes. Our walk goes on along a wonderful beach side and takes us into a small village. Getting here, we face what is considered the only slightly tricky part of the hike – a really, really high hill that the locals, including our shuttle driver, lovingly call the “Mama Hill”. The Mama Hill actually becomes quite of a challenge since it, in fact, is very steep. We conquered it in approximately 15 minutes and got rewarded with another stunning view of the whole area. I must admit the top of Mama Hill feature unique rondawels on your left, a few cows judgmentally watching you on your right and nothing but wide yellowish green hills in front of you. This untouched nature is unbelievably peaceful and the calm atmosphere makes you feel connected to everything around you. Just wonderful! The rest of the hike leads you around a few of the various beautiful grassy hills of this valley, moving mostly along the coastline and basically using tiny goat paths. This part of the hike will take you up and down and up and down again, but at least there are no steep inclines as to climb the Mama Hill – so let’s say it’s easy! Without any doubt, I would say it’s one of the scenically most beautiful hikes you can do in South Africa! Second morning at Coffee Shack – another day to fill with activity. This turns out to be quite easy at this backpacker since it has a load of opportunities to offer. This place is especially famous for its unbeatable deals considering surfing lessons, from single sessions to whole five–day packages. Single sessions are available three times a day, so you will definitely get your chance – just make sure to put your name on the list at the reception the day before. The backpacker provides everything you need, including the boards and a fitting wetsuit. Pick up point is at the hostel and the surf instructor walks with you to the surfing beach which is about 5-10 minutes away. Surfing lesson starts with an instruction ashore, explaining you how to handle the surfing board and the motion sequences in the water. Coffee Shack surfing instructors definitely make sure you know what to do once you hit the waves. Still, getting on the board is so hard! And during your first lesson, you can be super proud if you actually manage to stand on the board for a few seconds. After this, you deserve a huge meal – and trust me, you are going to be hungry! Surfing lessons are not the only thing the Coffee Shack has to offer. This backpacker bribes with a number of free activities, such as for example several parties with free drinks, free Sunday dinners or pool competitions. An absolute highlight for me was the free sunset drive. Just a few minutes before sunset, you jump into a safari car and the driver takes you up to a sensational viewing point on top of a hill at the ocean side. Prepare yourself for an amazing sunset, overlooking the entire beach while having a cold drink – an incomparable experience in between a beautiful, typical African landscape like this. Absolutely priceless! Looking back at my trip so far, I can, without a doubt, say that Coffee Bay has been one of my favourite places to visit. It offers an incomparable scenic beauty and the charm of the untouched Africa. Plus, the generosity of Coffee Shack Backpackers made our stay an unforgetable experience! Go stay at this wonderful place! 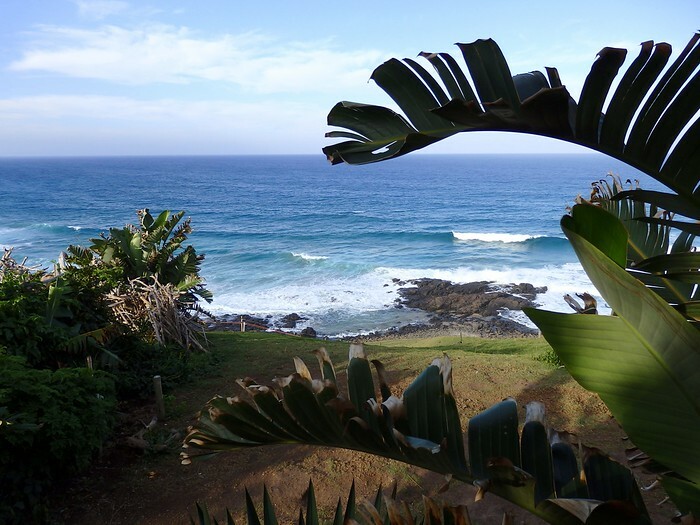 If I needed to summarize, I would say Coffee Bay is very close to paradise – and not just for surfers! It only takes approximately an hour from Durban to Umzumbe, so we arrive at the Mantis & Moon Backpackers Lodge early in the morning. Early enough to catch the shuttle to Oribi Gorge, a canyon and nature reserve in southern KwaZulu-Natal – and setting for a range of activities that guarantee to get your heart pump out of your chest! Your options there are various: Starting quite chilled with horseback riding, hiking and mountain biking, it gets more adventurous with white water rafting, abseiling, zip lining and – last but not least – the highest bungee swing in the world! Doing a usual bungee jump would have never been an option for me. The thought of being attached at my ankles, jumping head first and then hanging there, head down and feet up… oh hell no, never in my life! But being attached around your waist, using a full body harness and actually being able to jump normally makes it appear so attractive to me. Probably the closest I will ever get to a proper bungee jump and with 165 metres the highest of its kind in the world – there is no chance I will leave Umzumbe without doing this! Bungee Swing, I’m coming for you! The excitement turns into fear pretty quickly as soon as I reach the office of Wild 5 Adventures, which is located at the top of the Lehr’s Falls, directly where the bungee swinging takes place. Looking down into the gorge, it appears super, super deep. And that makes the jump seem so, so, so scary! Still, I am dead sure that I will regret this in the evening if I chicken out now… So I just jumped! This is so amazing! Even though the whole jump is just a few seconds long, it’s definitely enough time to experience that roller coaster of feeling: First being in shock of “Why the hell am I actually doing this?”, then the fun of the free fall, third the relief of the rope catching you and finally the relaxation of you cosily swinging around the beautiful scenery of the gorge. I was scared to death before doing it, but once I’ve reached the lowest point of the swing, I screamed out of my lungs, asking: “Can I do this again?”. So in the end, I can without a doubt say, there is nothing to be afraid of, rather be excited for it! Also, the staff are absolutely professional, explaining the whole process very patiently and the gentleman at the jumping point even makes the final steps a bit easier for you by giving you a little push. Thanks man! Standing in the middle of the Suspension Bridge, which is located just around the corner and hovers 100 meters above the gorge, looking back at where I jumped made me feel so happy I did it. If you are looking for some adventurous stuff to do, Oribi Gorge is the perfect place to go and Umzumbe offers super easy access to get there. And even for the not so adventurous, this gorge definitely is a must see due to the amazing view of a stunning freak of nature. A very special place with a lot of possibilities! Getting back to the hostel, we loudly get welcomed by the furry inhabitants of the Mantis & Moon. This may not be a place for people who are scared to death by huge dogs, but everybody else will absolutely love it. However, this is not the only unexpected animal encounter you may experience here. Staying at this backpacker, prepare to experience the sound of monkeys fighting on top of your roof – don’t worry, it’s not Tokoloshe! If you don’t know what Tokoloshe is, I suggest you to google it AFTER visiting Mantis & Moon…At the backpacker you’ll experience a nice jungle atmosphere, which makes it a unique place to visit. I highly recommend staying in one of the super fancy treehouses, to enjoy the tropical vibe to the fullest. The beach is just around the corner and it doesn’t even take five minutes to get there. The weather drastically changed during the day, so the sea appears to be a bit rougher than in Durban. To be honest, it’s really rough! So even just taking a swim in the ocean can become quite a challenge here in Umzumbe – a place where action awaits you behind every corner! THE BOOZE CRUISE – WHAT SHALL WE DO WITH THE DRUNKEN SAILOR? After such an adrenalin rush, I felt like doing something chilled out the next day. As a lucky coincidence for me, it was out of the two days of the week where the hostel organized Booze Cruise for their guests. The concept of the Booze Cruise is pretty easy to explain: You get onto a boat, you listen to live music – and you drink lot of booze! The cruise starts at a pretty private property with a nice garden right at the riverside of Mzumbe River, only a few minutes’ drive away from the backpacker. There, we meet our cute and brisk companions for the cruise and sail off. Sometimes, all you need to be happy is a glass of wine and some good company. This Booze Cruise offers both of this, plus nice scenery. This, in combination with some good songs played on the guitar creates a super chilled vibe. Keep the wine pouring! The cruise also includes a tasty snack, consisting of different kinds of nice fresh sea food that we pick up along the way. It couldn’t get any better! So if you ever wanted to know what it is like to get tipsy on a boat, the Booze Cruise definitely is a nice activity to recommend for filling a chilled afternoon. As it slowly gets fresher, we decide to turn around – and continue the party at the backpackers! Waking up the next morning, totally hungover and trying to get ready to catch the Baz Bus to Coffee Bay, I came to the conclusion that Umzumbe can cover different needs: Since it is a super small little village, you can come here to escape the fast moving nature of Durban and enjoy the quietness of this place for as long as you need. The beach is basically never overcrowded, even on a sunny day and for all those who are searching for a bit more activity, adventurous stuff can be found here. I definitely got the goose bumps I was hoping for! Without doubt, I will be coming back here again – as I still need to experience the zip lining in Oribi Gorge! Durban promises a lot: Endless beaches, perfect surfing waves and summer 365 days a year. So first stop after arriving in Durban clearly is the beach to check if this city can keep up with the high expectations. Well… it most definitely can! While weather in Cape Town already appears quite winter-like, you’ll definitely get the most amazing tan in Durban. Simply enjoy a relaxed day at the beach, have a cocktail at one of the many restaurants with white soft sand between your toes and a cloudless skies. This was by far the best holiday destination I’ve come across! I’d recommend everyone to rickshaw drive along the beach to enjoy the paradise feeling to the fullest; you can even negotiate your own price. Right next to the beach there is uShaka Marine World, claiming to be Africa’s No. 1 theme park and offers unlimited fun. How could I not test this? In fact, this theme park has plenty of different activities to offer: a water park with the highest water slide in Africa, diverse sea animal encounters, snorkeling, sea world shows, aquariums, rope adventures and a lot of shopping! Since I’m not that much into sea world shows and would rather do certain encounters like shark cage diving in the open sea than in an enclosure, the best option for me seems to check out the aquarium, dangerous creatures and – of course – the shopping mall. Entering the aquarium starts with a huge boom – the real skeleton of a whale. I did not expect that and was super impressed! All in all, there are lot of animals to see in uShaka Marine World Aquarium: Sharks, jellyfish, manta rays, sea horses, turtles and more. But what really makes this place so enjoyable is its presentation – it really makes you feel like being on board of a huge submarine and creates a nice under water atmosphere. The whole theme park is arranged very caressingly and convinces with its love for detail. It is a very touristy, but colourful place with a lot of activities to offer for almost every taste. I for example think the penguin feed is super cute and feeding a manta or a turtle was absolutely fun to do. There still are so many other options – meeting dolphins and seals are just two examples of the countless things to do there. I highly recommend taking a short browse through “Dangerous Creatures”, an exhibition of various reptiles and other not so fluffy animals, which is located inside the mall. Prepare for one or two funny pranks that will give you the creeps! And after having lunch at one of the countless restaurants and snack bars around here, go and have a dessert at Granny’s Fudge Shop! So many different flavours of fudge that it will be hard to decide which one to taste – and every single one are mouth-watering. Trust me: You do not want to miss this fudge! After spending half a day on the very touristy side of Durban, I felt like digging a bit deeper into the daily life of this city. Durban is home to the largest population of Indians outside of India and the cultural influence therefore is quite strong. One of the best places to delve into this influence is supposed to be Queen Victoria’s Street Market, known as a must do shopping experience around Durban and a still existing connection of the city’s historic ties to India. I experienced Queen Victoria’s Street Market as a crowded, fast-paced and vibrant place. It is busy, colourful and loud – and therefore, exactly what I expected an Indian Market to be! The offer is quite wide-spread: You get anything from clothes, jewelry , shoes and accessories to spices, fruit, vegetables, meat (dead AND alive) and fish to toys, DVD’s, CD’s and souvenirs. Basically everything, even things you can’t really figure out what it is. The market has a very special and quite unique atmosphere and allows you to purchase some super convenient bargains. I decided to go for the food and was really convinced. Queen Victoria’s Street Market is a nice place to try typical South African desserts, like for example a fresh baked snowball or Koeksister. Or pop into one of the many Indian takeaways along the street and get what I would proudly call the best Indian food I’ve ever had so far. I was craving for a usual curry with rice so bad, but apparently Durban is THE best place to try a bunny chow, which is basically just curry too, but served in a hollowed out loaf of bread. Sounds delicious! After one or two hours of looking around, I leave the Indian market without any purchase, but with a full stomach. I slowly make my way back to the hostel, checking out the city center. I heard some hostels propose really interesting inner city tour and surf initiation. Maybe you should check out? I think that Durban is a nice place where you can easily spend two days without being bored. On the other hand, I do get that most people may not really feel the very touristy atmosphere of this city. So, are you going to like Durban or not? It depends – are you rather searching for the rural scenic beauty of Africa? Then you can easily just use it as a compulsory stop-over and spend no more than only a night without any regrets. Do you from time to time need a bit of shopping and some city flavour? Then rather spend a day or two – I myself definitely loved it! Even the drive to the Northern Drakensberg already looks promising! Crossing over hilly landscapes, spread in the nicest shades of autumn-like yellow and light brown grass one can imagine. I have a slight foreshadowing of how beautiful it will be to hike here. And upon arriving at the hostel, even the view from our terrace at Amphitheatre Backpacker is super stunning. The two most popular day tours this hostel offers are Lesotho and the Tugela Falls hike, usually taking place alternately. 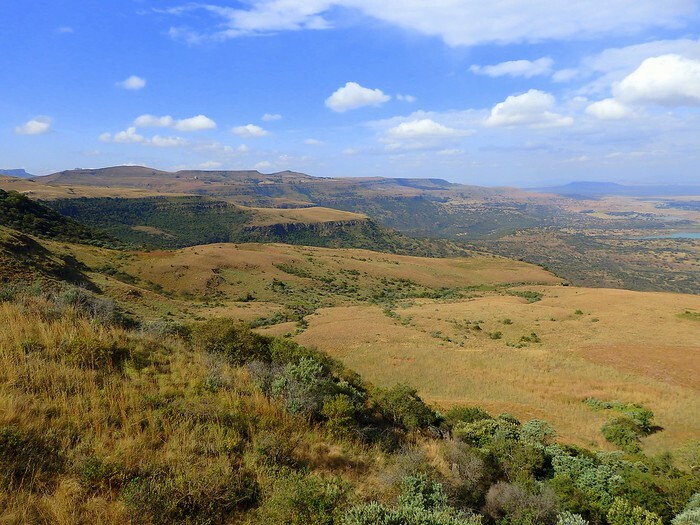 Since we planned to spend three nights in the Northern Drakensberg, it is possible for us to do both day tours – which is one of the main reasons why I would highly recommend staying at least three nights for everyone planning to come here. However for those on a time schedule who won’t be able to attend both day tours, the area has plenty shorter activities to offer. The lodge is located on a bewildering piece of land , so even exploring the surroundings of your accommodation can turn into an experience on its own. You can hike around the wide fields of wild flowers and make your way to one of the dams around to take a refreshing swim. Or if you prefer, take a splash in the pool or the Jacuzzi! First morning waking up in Northern Drakensberg – off to Lesotho! After about an hour of driving, we enter Lesotho over the Monantsa Pass, which is super rocky and may be a challenge even for experienced drivers. Prepare for a bumpy, but funny ride! In exchange for that, the mountain scenery around us is just beautiful! This wonderful landscape results by the fact that Lesotho is surrounded by a mountain formation which is seen as the natural border to South Africa – in fact is the only existing border since Lesotho is completely landlocked by ZA. What makes Lesotho unique is the altitude it’s located. The lowest point of 1400 metres above sea level makes it the highest country in the world. This is just one of the many interesting facts the headmaster reveals as we meet up with him at the primary school of the small town we visit. Want to impress him when you do the tour yourself? Keep in mind that people in Lesotho are called “Basotho” and the language spoken here is called “Sesotho”. The tour continues with a scenic hike taking us through a unique landscape of wide fields, dappled with traditional rondavels and framed with impressing rock formations. Making our way down again, the view gets even nicer – and if you are not afraid of stepping into goat poop, you might as well check out the super interesting caves along the way. Coming down you pass private houses of Basotho people who actually cultivate grass during winter, so that their cattle have something to feed on during the dry summer months – completely unusual, but absolutely necessary in a climate area like this. As we reach our starting point and jump back into our minibus, I can say that it was a nice, short and absolutely enjoyable hike that gave us a wonderful insight in Lesotho’s scenic beauty. We continue our trip with what Sia declares as one of the highlights of the Lesotho Day Tour: tasting a traditional Southern African beer! This experience is… well, let’s call it special! The taste is quite unique and definitely not for everyone. I don’t really taste any alcohol, but a lot of sour. Sia took three German guys on this tour a few days ago who loved this beer so much that they got themselves three bottles of it and even emptied it on the drive back to the hostel! That must be real beer love! All in all, it depends on your personal taste if you like this drink or not – you may hate it or love it, so definitely try it once you’re here! Next stop on our day tour – and my personal highlight – was visiting a traditional healer in her private house. Sia’s amazing translation skills make it possible for us to ask her on her daily life as a healer and her dramatic way of getting there. This woman is unbelievably heartily, amiable and open to answer every question with such a pleasure that you immediately fell super welcome at her home. Not forgetting the story she has to tell is absolutely breath taking! Despite this, she is going to tell you everything you want to know about the myths, superstition and esoteric culture of the Basotho. Very interesting! Final stop of our tour is at another local lady’s house to try the traditional food of Basotho people, which is a maize porridge, called “pap” and some vegetable mash. A must do is eating it with your bare hands, just like local people do. Sia is gladly going to explain you how to eat it properly. And it actually tastes super yummy in combination with the vegetables and is a delicious hearty meal. Even though, I could not imagine eating this (and nothing but this) every day, three times a day for the rest of my life – which is basically what people in Lesotho do due to their economic and agricultural situation. Another precious insight into a state that is considered one of the poorest on the African continent – but so full of unforgettable scenic beauty! At the end of the day, when going back to Amphitheatre backpackers, you cannot help but leave a little piece of your heart in Lesotho with the people living there. Next morning, next adventure, Sia on our side again! As we jump into the bus that is going to take us to the beginning of the Tugela Falls hiking track (which is already at an altitude of 2500 meters), we ask him to rate the level of difficulty of this hike on a scale from one to ten. Seven is his answer – that will be funny! The hike starts quite relaxed with a zig zag pathway taking us along a beautiful misty hilly landscape. The incline at this part is easily manageable, but noticeable enough to warm-up your muscles. And with this scenery around me, I kind of feel like I’m part of a Lord-of-the-Rings like fantasy movie. After continuously following the zig zag, we get to a tiny, tiny path that takes us around the massive mountains, up a short ladder and to our first battle combat: A massive stone gully we need to climb to reach the top of Amphitheatre Mountain. Getting up here seems so much more difficult from down below than it actually is once you’ve started. Just be careful, watch your steps, be aware of rolling stones and you will be perfectly fine! This part literally is “climbing” instead of hiking since you often have to pull yourself up and take very high steps – but it is so much fun! I never did something similar before in my whole life and I enjoyed it so much that I might even have discovered a new hobby. Once you reach the top of the gully, you literally find yourself standing in between the clouds. The highest point of the summit is at about 3254 metres above sea level – and that’s why you feel like standing on top of the world while doing this hike. As we move further on top of the Amphitheatre, the height gives you the creeps in a good way. And walking in between a field of white candy cotton clouds is so unique. As much as I enjoy crossing the top of the mountain through this scenery, everything has it pros and cons. And our cons reveal when we get to the point where the second highest waterfall in the world is supposed to be – because through this cloud cover, it is nowhere to be seen. The fog gets so strong that there is no chance to spot the waterfall, but at least we can hear it. The extraordinary landscape and weather changes so fast on top of the Amphitheatre and that makes this beautiful hike so exciting. But not to forget, walking along this many-sided scenery equals another thing: Getting closer to the legendary chain ladders, our second battle combat during this hike! Before going to the Drakensberg, a lot of people told me stories about these ladders and how scary they are. And to be honest, it really looks so scary when you finally reach them! In case you feel absolutely insecure, your tour guide provides some safety ropes to secure you while you make your way down. I decide not to take any, since it is not my first time climbing ladders and I’m asking myself: “Why should it be that much different, just because I got a rock wall in front of me?” It actually turns out to be very safe and stable. Coming all the way down, you have to climb two ladders: First one about twenty meters, the second one about forty meters. Each section gives you the opportunity to choose between two different ladders: An older one, which is still in good nick but might be a bit loose, and a newer one, which is properly mounted to the face of the rock and gives you a bit more stability. I decided to take the more stable option, since I was so nervous at first. But after the first few steps down, it turns into an enjoyable thrill! So amazing! Looking down actually helped me during my descent, but you may find that it is easier for you not looking down. Just always keep in mind – nothing bad will happen to you as long as you stay calm and focused. So far, everyone always made it down in one piece and so will you! The rest of the hike takes us around the mountains, past the bottom of the stone gully, along the zig zag and safely back to the car park where we started the tour. Coming down the chain ladders, I thought I had already seen the best of the Amphitheatre – never have I been so wrong. The view during the way back is the most amazing so far and absolutely mind blowing. Reaching the car park and looking back at the day, you do feel like you conquered something amazing today. The hike is about 12 kilometres long and has some difficult parts, but every single step is worth the magnificent scenery you can enjoy during the tour. Not for a single second was I sad for not having seen the Tugela Waterfall properly – I rather consider it as a reason to do this hike again someday. Right know it just feels incredible having overcome the fear of the ladders and having mastered the stone gully – the two things that in the end make this hike so special and fun. So whenever you go to the Northern Drakensberg, the Tugela Falls Day Tour is an absolute must, but keep two things in mind. First: When the day is not so cloudy, bring your bathing suits! You can actually take a short and refreshing swim on top of the Amphitheatre when it is sunny and hot enough. And second: Ask Sia to take a picture of you with your phone and check it once you’re back in the shuttle. A good laugh is definitely guaranteed! The Northern Drakensberg is a place not to be missed while traveling South Africa – so different from how you would imagine this continent to look like, but so full of beauty and so unique. If you’re searching for a landscape that makes your jar drop every five seconds, this is the place to visit. That’s what I keep telling myself, while waking up at 5 am in the morning, getting ready for the shuttle that is going to take us to Kruger National Park. Day one of our 4 Day Wildlife Safari has begun – and it starts quite impressive – even before we reached the gate of Kruger. 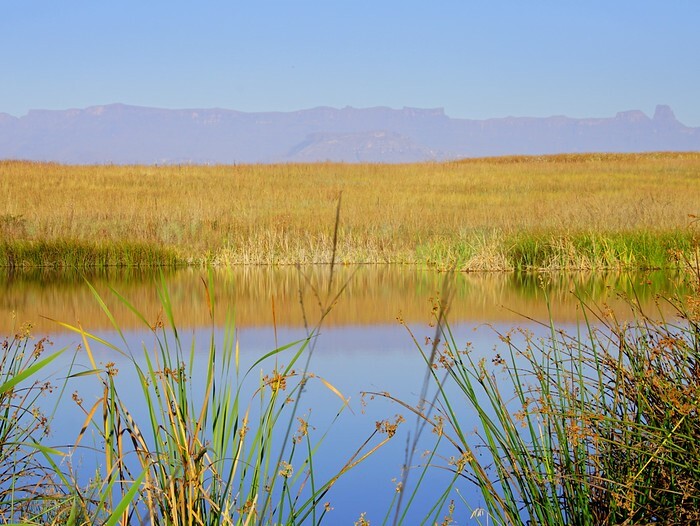 It takes approximately six hours to get from Johannesburg to the National Park, driving along the Abel Erasmus Pass – a scenic mountain road that leads from Mpumalanga to Limpopo. Stopping at the entry of the 133m long Strijdom Tunnel to enjoy the amazing landscape, enjoy photo opportunities or browse through the tiny shops at the parking lot , is an absolute must while driving that route! After this stop, we continue straight to our camping site close to the borders of Kruger National Park. A cosy and peaceful place that offers a pool, a campfire, a nice little dam right on the property! After a small break at the camp for unpacking and checking out the area, we go on to Moholoholo Animal Rehabilitation Centre, home for many of South Africa’s abandoned, injured or poisoned wildlife. Moholoholo is known for their high contribution to wildlife education in South Africa and as we join a guided tour around the park, it is easy to see that they are absolutely passionate about what they do. There is plenty of things you can explore in Moholoholo – educate yourself on the history of the lions, leopards, servals, wild dogs, eagles and many more animals currently living there. They also offer the chance to interact with some animals inhabiting the centre. Petting a cheetah and feeding a vulture was an absolute highlight during our visit. Another thing not to be missed while visiting Moholoholo is getting to know Stoffel, the probably sneakiest honey badger in the world! Due to his countless clever attempts to escape the fences of the Rehabilitation Centre, it was featured on BBC and he is now famous on YouTube – what an honour to meet such a superstar! And after watching him for a while, his outstanding comedian talent seems undoubtable. Listening to the owner revealing Stoffels funniest getaway missions is unbelievably hilarious. Check out this video to get a first glimpse on his golden moments and prepare for some tears of laughter ! Visiting the Moholoholo Animal Rehabilitation Centre was informative, super interesting and peppered with a lot of nice surprises – all in all, an amazing start to this 4 Day Wildlife Safari! Ending the first day by sitting around the campfire with a glass of free wine and getting to know the rest of the group is super relaxed. And as Goodman, our lovely tour guide, asks us about our expectations on this safari, we all start to share our biggest wishes for the following three days. For me, it’s definitely seeing at least one lion. At this moment, none of us knew how spoiled on amazing sightings we all soon would be! DAY 2 : 4 of the BIG 5 in a day ! The drive begins at 5:30 am – another early start in the day! But for those who worry that they might not be fully awake after the one hour ride to the gates of Kruger National Park – trust me, you will be! It is freezing in the morning and the wind is blowing like hell, which is absolute fun as long as you make sure not to forget your blanket before jumping into the safari car. Even though it might be a bit cold, watching this beautiful red sunrise inside of the Kruger does absolutely make up for it! As if this sunrise isn’t already stunning enough, the first 20 minutes inside Kruger just turned out to be magic! As we slowly cruise along the road, our tour guide suddenly stops the truck, sniffing the air, saying: “I smell elephant!” And his elephant detecting skills show up to be quite reliable, as a bull elephant sneaks out of the bush and cosily crosses the road right in front of us just a few seconds later. So amazing! This hilarious and unique moment is soon followed by a huge number of unbelievably precious sightings – so precious that you even quickly get used to the herds of impalas, zebras, giraffes and wild beast surrounding you almost all the time. One of the most memorable animals we got to see was definitely the two rhinos passing by. Due to the high number of rhinos getting killed because of their valuable horns in the past, the amount of rhinos still living inside of Kruger National Park is kept as a secret and not even revealed to the tour guides crossing the reserve every day. Apparently, this sighting has become one of the rarest during the last couple of years, which might have been a reason for the whole group – including Goodman – to absolutely freak out when spotting them. It even almost over trumps the group of three lions peacefully taking a morning nap in the bushes shortly after… but just almost! Lunchtime has come and we decided to stop at one of the picnic sites in the National Park to prepare our own tasty meal and take a break. But stopping the drive does not prevent you from experiencing amazing things around Kruger! As we finish our meal and head up to a viewing point at the braai place to have a coffee, we get to see the funniest thing ever: A hippo couple making love in the river right underneath us! Now I definitely know what it feels like to be at the right place at the right time! Yummy food, a nice view and good entertainment – what else could we still wish for? The only thing missing now was some thrill… which already awaited us around the corner. As we continue our game drive around the National Park, everybody starts smelling something, but this time, it wasn’t an elephant! It was worse! As the smell starts getting unbearable, we noticed the corpse of a hippo lying next to the road, surrounded by a bunch of vultures. Seems like this poor creature wasn’t as happy as the two previous that we just saw! Watching some vultures fighting for the best parts of the corpse, while others were picking the hippos eyes out to eat them appreciatively, was absolutely gross yet absolutely amazing at the same time! If you haven’t been stunned by the sometimes cruel but nevertheless breathe taking diversity of wildlife in nature, this is the moment for it to happen. After a certain amount of amazingness in just one day, we weren’t expecting to be astounded yet again. But on our drive home, as it starts to get darker and we were slowly getting closer to the exit of Kruger, the magic continued. One of the biggest wish people do when entering the Kruger National Park is spotting the Big 5: Lion, rhino, elephant, buffalo and leopard. On the final meters before leaving the park, we actually almost bump into a huge group of buffalo’s enjoying their dinner right in front of the fences. Four out of five of the Big 5 on the first day was absolutely amazing! The question we asked ourselves then was: Are we going to find the leopard tomorrow? Hitting the road of Kruger National Park again this morning, we all have the same thought: Leopard, we are coming for you! This turns into an interesting lesson on how to track animals, as our tour guide took his time to explain the different footprints and traces of the animals living inside the park. Constantly staying on the leopards track, we blunder into another amazing precious sighting: African wild dogs! There are only an estimated number of 450 to 500 wild dogs left in Kruger, so they are one of the rarest sightings in the National Park. And after watching them cuddle and play with each other just in front of the car, I can without doubt say: They are most definitely one of the loveliest too! No wonder why they are Goodman’s favorites! Regarding the weather, this day turns out to be even nicer than the previous – nothing but blue sky and sunshine, with tiny, tiny cotton candy clouds. That absolutely underlines the grandness of Kruger National Parks outstanding scenic beauty. As someone living in Europe, this place is so completely different from home. And that’s what makes it so special just being here. The animal’s performance today doesn’t fail to impress, too. Have you ever seen a giraffe drink? It is absolutely hilarious! Apart from that, this day seems to be family day in Kruger National Park. Just after finishing lunch, an elephant catch our eyes, slowly making is way out of the bushes nearby the parking lot. Seeing him already gets us excited, but that was before we realize he was the leader of a whole caravan of elephants heading to a water hole. As they start sneaking out of the bush, one by one, some even holding on to each other trunk to tail, this turns out to be so extraordinary that it left us all speechless! In complete, we counted 32 elephants in a row! This moment, followed by the unbelievably cute giraffe family watching us as we pass by shortly after, perfectly reflects the innocent artlessness of animals and untouched nature. This peacefulness quickly gets interrupted by an information another visitor gives us as our ways cross: There’s a leopard only 7 kilometers up the road! Oh yes, we were back on our mission! Reaching the place where the leopard was supposed to be, we didn’t spot the cat itself, but parts of the poor impala that became its last victim. Apparently, the leopard felt like saving a little snack for later and left a haunch hanging in the tree – not nice to look at, but that’s what nature is about: Killing and getting killed. And the feeling of experiencing this so close was super adventurous! As we scan the area, searching for the leopard in person, we cannot help but think that this sneaky cat was hiding somewhere around, perfectly camouflaged in the dry brown bushes, probably watching us. Time passed, but he was nowhere to be seen or heard. We then had to admit that the leopard won this round and make our way back to the gates, but the chase wasn’t over yet: We still had the nocturnal drive waiting for us! The night drive started an hour before sunset and took place in a private reserve very close to the campsite. The landscape differs a lot from Kruger National Park, since it does not domicile any elephants, which tend to topple trees to make the leaves – their favorite food – easier to reach. It is a beautiful place with a lot of green and tiny little lakes and rivers, which are super fun to cross with the safari truck. An adventurous and super funny bumpy ride! The reserve is home for a huge number of zebras, buffalos and – as an absolute highlight so close to the end – a couple of rhinos and their babies. Watching a mommy rhino and her little bundle of joy munch on their dinner is absolutely adorable! As the sun sets and it’s slowly started to get dark, it was time to take a break and have a drink together with the group. The truck was packed with free wine and snacks and the sunset turns our surrounding into a stunningly beautiful red and orange wonderland. In combination with an amazing group vibe, this moment was just perfect! How could you not be happy now? Knowing that this was our last evening together, we all still got kind of emotional. Goodman knew how to describe this feeling in a lovely humorous way: “I’m going to start cutting the onions now.” Yes Goodman, we know exactly how you feel: I think all of us could have stayed in Kruger for much, much, much longer. Well, all good things have to come to an end sooner or later… but not yet! Getting back to the camp, we still had our last dinner together – an amazing typical South African braai! Damn, our chef Martin definitely knew how to do his job ! Later, while sitting around the campfire after dinner, Goodman asks us our feelings about the safari. What was the most precious moment for us? Have our expectations been fulfilled? To be honest, mine haven’t been fulfilled… they have been exceeded! Am I sad that I haven’t seen a leopard? Not at all! I see it as another reason to come back someday, apart from the overwhelming beauty of this lovely spot. I cannot really decide on my favorite moment, because somehow I see the whole safari as a huge golden moment of my time in South Africa – and that was before I even knew, what kind of highlight would be awaiting us on the last day. DAY 4 : A view you’ll never forgot ! Early in the morning it is time to leave the camp and start our way back to Johannesburg. Even though we have already seen the Abel Erasmus Pass on our way here, the amazing weather makes the landscape blaze totally different and full of colour. I did not expect to be surprised again by a road we have already seen the first day, but South Africa made it possible! As we drove past a stunning mountain formation that looks quite impressive from down below, we all knew: Blyde River Canyon was close! Blyde River Canyon is the third largest canyon on Earth and the largest GREEN canyon in the world – which absolutely explains the mind blowing uniqueness of this outstanding inherent natural beauty. Overwhelming! After this last wonderful stop, it was time for farewell. I have to admit, I would have never thought it would be that hard. But after spending the last couple of days together and sharing so many unforgettable moments with this group, it felt like saying goodbye to my family. A lot of people say that travel is not only about the places you go to, but also about the people you meet. And after rocking these four days with this bunch of people, I can absolutely agree on that. To conclude, this 4 Day Wildlife Safari has made me richer in a lot of ways: richer in experience, richer in memories and richer in friends. It was an unforgettable journey and I would like to thank Baz Bus and every single person that was part of it. If you are traveling South Africa and there’s somehow a bit of time left to do a Wildlife Safari in Kruger – don’t hesitate, just do it, no matter how! After experiencing it myself, I can definitely say that it is an absolute must do point on your bucket list. You will quickly understand why as soon as you pass the gates – it’s going to be an incomparable experience! If my journey didn’t convince you enough, you can also have a look at the video an other group did here (spoiler : they were lucky enough to see a leopard!). More info about the 4 Day Kruger Safari and Wildlife Tour here. Baz Bus is even selling a package including the 4 Day Kruger National Park Tour and a Hop-on Hop-off ticket from Johannesburg to Cape Town or Cape Town to Johannesburg, check it out here! Three days ag o I arrived in South Africa, I jumped out of the plane, excited and so damn ready to see as much of this wonderful and diverse country as possible. By joining the Baz Bus Cape Peninsula Day Tour, I knew I would see the best the Cape Peninsula had to offer. Checking out the schedule, this day tour seemed to be very well planned and organized: First stop in Hout Bay, home of the Duiker Island Seal Colony, next a light morning snack within the route of Chapman’s Peak Drive. Next stop Simon’s Town, visiting the Boulders Beach Penguin Colony. Then moving further South to the Cape Peninsula Nature Reserve to have a scenic cycle and a tasty lunch. And last but not least, checking out the Cape Point Lighthouse and the worldwide-famous Cape of Good Hope. Arriving at our first stop, we could either choose between staying onshore and exploring Hout Bay harbour or joining an optional boat cruise to the seal colony at Duiker Island. Personally I wouldn’t want to miss out on seeing the seals (they’re so adorable! ), so I stepped on board as quickly as possible. Fortunately for us the sea was calm on the day, the cruise was relaxing and the boat gently swayed with the light waves. The bay is bordered by pretty little beaches, sweepingly high mountains and hills covered with lush fynbos. This smiling landscape is eye-catching and was a wonderful and quiet start into the day. The boat cruise was incredibly enjoyable and I was fascinated by the hundreds of roaring seals that inhabited Duiker Island. If there’s one thing these fluffy furry little fellas mastered perfectly, it is: Simply to enjoy life! As I watched the seals sunbathing in the sun, cosily rolling themselves from one side to another, others happily splashing around in the deep blue water, I was thinking to myself: Damn, I should do that more often! Without a doubt, these cuddly animals are an incomparable example on how to have a perfect lazy day in the sunshine – and by doing that; they ‘“sealed”’ my weekend plans. As it is your own decision whether to join this optional boat cruise or not, I would definitely recommend spending R80 on this pretty impressive experience. Hout Bay Harbour itself is undeniably beautiful and offers plenty of other things to do for people with motion sickness. We bordered the bus and continued our trip to Chapman’s Peak Drive, which is considered to be one of the most beautiful scenic drives around the world. I visited Melbourne last year and I knew that it would be quite hard to impress me after already seeing the Great Ocean Road in Victoria, Australia. Even though I am no freshman when it comes to incredible landscapes, Chapman’s Peak Drive left me speechless. It is not an exaggeration to say that this drive crosses an area of indescribable inherent natural beauty. To my pleasure, Baz Bus stopped in this wonderful setting, to have a light snack. As I sat there, a blueberry muffin in my right hand, a glass of orange juice in my left hand and a breathtakingly pretty view in front of me, I started wondering: Can this day get any better? I didn’t know how close I was to finding out that it most definitely can! Once we arrived at Boulders Beach, home of hundreds of Jackass penguins, I already had a slight sense that this would definitely be an absolute highlight of my trip to South Africa. I can’t help but adore these cute black and white suited birds. As penguins usually prefer to settle down on places more sealed off from the access of human beings, it is quite special for this colony to call Boulders Beach their home. These little guys actually seem to enjoy the attention of their numerous excited visitors and I absolutely enjoyed watching them as well – so entertaining! Depending on how much time you have on that day, you could also leave the fences of Boulders Beach Sanctuary for a couple of minutes and explore a quieter beach next ­door. Just ask your tour guide to point you in the direction of this “secret” spot! By doing this, I was rewarded with the chance to get closer to a few penguins. Luckily, they welcomed me immediately and let me join their private sunbathing session. The penguins at Simon’s Town are so used to their human visitors that usually they don’t mind having people around them. However, if they give you any sign of refusal, better bow out and let them have their space. In the end, this is the penguin’s habitat and we are the ones visiting, so it is our responsibility to respect their need of peace. You can always ask your Baz Bus tour guide any questions about the behaviour and habits of this species. In my case, they acted something between curious, excited and ‘“Ugh, whatever!’” when coming closer. As we moved further through Table Mountain Nature Reserve, I knew it was about time for a classic part of the Baz Bus Day Tour – the 6 kilometre downhill cycle. As we hopped off the bus and waited for the bikes to be offloaded, there were two different things that kept me entertained: The unique beauty of the place where we stopped – wide endless fields of bush, sprinkled with uncountable different shades of green, surrounded by mountains and hills – and the unbelievable strong wind blowing and turning your hair into a total disaster. The wind also turned a usually easy cycle into a mini battle against Mother Nature. It was fun and trust me, when you’ve beaten that wind, damn you will be starving! Even though the cycle is supposed to be quickly done within 30 minutes, it took me much longer. Reason for that: Crossing the Nature Reserve, I couldn’t resist but had to stop for a few pictures to appreciate the amazing landscape. One thing you have to keep in mind when jumping on your bike: shortly after the cycle begins, the tour guide and the driver are sneakily going to catch up on you to take a shot of you riding your bike. So don’t forget to keep that one million dollar smile on your face – I totally failed on that task and this picture is going to haunt me on Facebook for the rest of my life! After some salad, some fruit and a few rolls (Don’t worry, there is no chance you will leave Baz Bus hungry!) the journey continued to the Cape Point Lighthouse. You will have to take a few stairs to get up there; I enjoyed the hike very much. Not just because it is easy to handle physically, but also because of the amazing view from up above that gets better with every step you take. This pushes you forward, no matter how much you may hate stairs. When I finally reached the lighthouse, the wind was blowing even harder and the force of nature became impressive. I definitely wouldn’t recommend wearing a hat, a cap or anything easily losable while climbing the last few steps upstairs (Yes, lady with that obvious wig, I’m looking at you!). For sure, not every day is a windy day. But during the Cape Peninsula Tour, I really got to know the typical Western Cape winds and I can tell you – don’t underestimate them! If you don’t want to be freezing like me, better bring a light jacket, just in case. However, being up there was breath-taking. Due to the post reminding you of how far away from home you are, it is a unique experience especially for people travelling from another continent – for example 9623 kilometres to London is quite a statement for visitors from Europe. Somehow, this awareness didn’t frighten me at all. There is some kind of peacefulness coming from your surroundings that envelopes you while up there. Unfortunately, every wonderful day has to come to an end. And in my opinion, the end of the Baz Bus Cape Peninsula Tour is quite epic. As we reached the Cape of Good Hope, the most South Western point of the African continent, the awareness of where you are becomes overwhelming. Walking along the beach and the mountains, looking across the ocean and knowing that beyond the horizon, there is nothing else left except for the Antarctica… made me contemplative. For me personally, visiting the Cape of Good Hope didn’t just mean taking a picture at the famous signboard, which of course I also did (Pics or it didn’t happen!). But essentially, it was an occasion to backpedal and appreciate the beauty of this place, the uniqueness of the moment and the absolute breath-taking diversity of this wonderful country. If I hadn’t already fallen in love with South Africa, it would have happened now! Looking back at the amazing day I’ve spent all over the Cape Peninsula, I can gladly give Baz Bus five stars for that tour. I have been blessed with a lovely tour guide and a hilarious driver. Do you know why the Beatles won’t ever climb a mountain? If you get Freddy as your driver, he is going to give you the answer enthusiastically. South Africa is on sale for half price! It would be rude not to visit! England’s Barmy Army recently traveled to South Africa to follow their national cricket team. So impressed were they with the exchange rate, they sang a song about it. The Spectator, a weekly British conservative magazine, says that there may not be a better time to visit South Africa. “South Africa has always been good value for British visitors, even five years ago when there were 11 rand to the pound. Now that figure is closer to 23 rand. For visitors, an entire country is half price. South Africa is open for business – and has a half price sale tag on it. South Africa’s Baz Bus, which links more than 180 backpacker hostels in 40 different destinations across the country, has become Fair Trade Tourism approved. Established in November 1995 by “retired” South African backpacker Barry Zeidel, Baz Bus came into being as a result of Barry travelling across Europe on a “hop-on, hop-off” bus service which he knew could be replicated in his homeland. “I was amazed at how easy it was, and that I was not restricted to a set itinerary and could get on and off for as long as I wanted, making friends and having adventures along the way,” says Barry, who immediately set about researching backpacking in South Africa on his return. A qualified accountant and entrepreneur, Barry is passionate about backpacking, and the Baz Bus network has helped to stimulate and unify South Africa’s backpacker community as well as making it easy, and fun, for backpackers from all over the world to explore and enjoy the Rainbow Nation. Today, Baz Bus carries more than 10,000 independent travellers along its door-to-door route between Johannesburg and Cape Town every year, connecting like-minded backpackers as they relax en-route, safe in the knowledge that when they get off the bus, it will be at the door of their hostel or connecting with a pre-arranged shuttle to their destination. The company is also making a huge difference to the lives of people in communities around Cape Town through various projects, supporting soccer teams in Hout Bay, a children’s shelter in Woodstock and the Wola Nani community centre for women and children living with HIV/Aids in Khayelitsha. It is currently building new toilet facilities and classrooms at Babes Creche and the Elundini Children’s home in Du Noon. “It made perfect sense for us to join the Fair Trade Tourism family,” says Baz Bus marketing manager Lisa McLaughlin. “We’ve always been committed to protecting the assets on which tourism in South Africa depends, especially where communities and the environment are concerned. Travelling on the Baz Bus reduces a traveller’s carbon footprint and our clients can rest assured that their holiday spend is directly benefitting the people in the communities along our route and in the projects we support,” she adds. Fair Trade Tourism is a non-profit organisation dedicated to promoting sustainable tourism in southern Africa and has certified businesses in South Africa, Mozambique and Madagascar, as well as mutually recognised programmes in the Seychelles and Tanzania. Its tourism certification programme was developed in 2004 and in December 2011 became the first in Africa to be recognised by the Global Sustainable Tourism Council. “Fair Trade Tourism also grows awareness about responsible tourism to travellers and assists tourism businesses to operate more sustainably through intensive, hands-on training and certification readiness programmes,” explains the organisation’s managing director Nivashnee Naidoo.